Use a corrupt steward to gain intelligence on the Stormcloaks. Rift Imperial Camp, Mistveil Keep. Report to Legate Rikke at the Rift Imperial Camp. Find evidence at Mistveil Keep. Search Anuriel's room until you find the evidence. Show the evidence to Anuriel. Finish the conversation with her. At the Rift Imperial Camp, Legate Rikke will inform you that Anuriel, steward to the Jarl of Riften, is involved with the Thieves Guild. She wants you to obtain evidence of this so that it can be used to leverage her into cooperating with the effort to regain the Rift for the Empire. She informs you that the mission will require "stealth and discretion". If asked, she will tell you that your destination is Riften, and she will mark Mistveil Keep on your map. The evidence is inside a dresser in Anuriel's room. You may prefer to do this quest midday, while she is in the main hall rather than in her room. Although not always necessary, you may wish to take some steps to make yourself stealthy as you must evade a guard who patrols the hallway leading to Anuriel's room, and then steal the item undetected. If this guard sees you, he will warn you a few times that you are trespassing, and may then attack you if you remain in his presence. However, you may also avoid this guard by waiting until he walks to the other end of his beat. If you stand in front of the Jarl facing her, you will see an open door to a hallway behind. A guard patrols the interior of this hallway. Watch for him to pass. After he walks to the left, wait a second or two, then go in and take a right. Anuriel's room is just around a corner. Steal the incriminating letter from inside the dresser, making sure that you are not observed. As an extra precaution, you may wish to close the door before you take it. Once you've taken the letter, show it to Anuriel. Once you've shown Anuriel the letter, she'll lower her voice and ask you to follow her to discuss the matter privately. She informs you that if you stick closely to her, the guards won't bother you. She will lead you back into her room. Once in the room, any conversation you have with her will result in her offering to give you information about a large shipment of gold and weapons in exchange for your silence. A successful persuasion will also cause her to offer a leveled amount of gold in advance, albeit angrily. Anuriel will tell you that the valuables are being transported by a wagon caravan in the area of Windhelm. She will relate that the wagon is heavy, and thus will be slow-moving, but is also heavily guarded. Inform Legate Rikke about the wagon. She will be pleased to learn of this, and will tell you that she has some scouts positioned in the area where the wagon is traveling. She will ask you to meet the men, overpower the rebels guarding it, and take possession of the valuables. She will mark your map with the rendezvous location, which is about halfway between Riften and Windhelm. Upon arriving you'll find an old ally, Hadvar, commanding the Imperial scout troops. He will acknowledge your past adventures and engage in some philosophizing about war and killing. You can skip this dialogue if you like. When you mention the wagon, Hadvar will inform you that he was tracking it already, and is curious how you know about its cargo. You can tell him or not. Depending on your dialogue choices, you may learn that the wagon is now stranded a short distance away, and that you are outnumbered by the rebels. Hadvar will say that he has a plan. If asked about it, he will suggest that although you are outnumbered, you can even the odds by employing the following strategy: First, he says that "we" will take out the Stormcloak sentry and then he and his scouts will situate themselves overlooking the camp. Then, you are to infiltrate the Stormcloak's position and create a distraction, at which time the scouts will unleash an archery attack. You can agree to this or let him know that you'll handle it on your own. If you agree to work together with Hadvar, you can proceed immediately or tell him to wait. If it is daytime, you can suggest that you wait until nighttime, which he will think is a good idea. If you suggest waiting, you can let him know when you are ready. Once you do so, you will note in your journal that will now follow him and ambush the enemy scout. Hadvar will suggest that you follow him, keep low, and hold your fire. He will walk and then stop a short distance away and may say "We'll take care of the sentry when he makes his next round." He may also tell you "Fire on my word". Hadvar and his men will crouch in a sneaking position and face directly north with weapons drawn. From the plan he originally laid out, it may seem that you are to wait until Hadvar and his scouts take out the sentry; this will never happen. Apparently when Hadvar said "we" will take out the sentry, he meant that you will take out the sentry. The closest way to follow the plan is apparently to place yourself just in front of Hadvar, facing the same direction as the others. Sneaking, creep forward through the two trees in front of you. Ahead of you, the sentry pauses at the far right end of a patrol route, offering the best position for targeting with an arrow. You may need to move slightly ahead and to the left to see the place where the sentry pauses. When the sentry is killed, your objective updates to "Take over the caravan." While Hadvar will repeat the idea that you are to sneak into the camp while his team positions themselves above it, things will again go not quite according to plan: quite likely, only Hadvar will position himself above the camp and attack with arrows. The other two soldiers will run directly into the camp and begin fighting. You have no chance to "infiltrate the camp," as was suggested. Your allies will generally take care of the Stormcloaks with or without your help, and the battle should be quite easily won. After the last enemy falls, your objective will update to "Report to Hadvar." If you then merely approach Hadvar, he will remark that you "make quite a team." Your work here is done, and the quest will complete at this point. 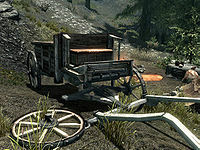 You can then loot the camp, including the chest of valuables in the back of the wagon, although this is supposed to be collected later to support the war effort. There is also an iron ore vein nearby: If you head up the mountain from the camp, there is a wagon turned on its side. Just downhill from this is a single flattish rock on the edge of the same side of the road. From atop this, walk northeast a few steps, just past the tree, then turn east. 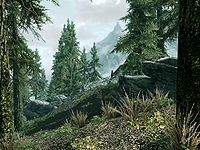 If you will continue to pursue The Reunification of Skyrim quest, report back to Legate Rikke at the Rift Imperial Camp to obtain orders for your final mission to regain the Rift. When you approach her, she will acknowledge your performance, reward you with gold, and say that she "will send some men to collect the prize. We can use the weapons here, and I'll send the coin to Solitude." This quest and Compelling Tribute (Stormcloaks) are different radiant versions of the same quest. If Riften is given to the Imperials during Season Unending then this quest will not be given to you. You can later revisit the camp where you ambushed the rebels. The chest in the wagon will respawn and can be opened by lockpicking. If you have completed Supply and Demand the guard will not challenge you. Hadvar occasionally will not allow you to report to him after the battle, which will make it impossible to finish the quest. Leaving the area and waiting for a few in-game days before trying to talk to him again can allow you to finally report to him. 10 Legate Rikke has sent me to investigate the possibility of blackmailing Anuriel. As Laila Law-Giver's Steward, she might be able to provide important information and assets. 30 Anuriel gave me information about a delivery of weapons and coin headed toward the enemy capital. I should return to camp and inform Legate Rikke. 40 Legate Rikke has sent me to meet with a scouting party that should be in the area of the enemy shipment. Together we will over power the enemy and secure the weapons and coin. 200 Finishes quest I have successfully blackmailed Anuriel and captured a shipment of enemy weapons and coin. The following empty quest stages were omitted from the table: 0, 25, 41, 51, 55, 100, 255. On the PC, it is possible to use the console to advance through the quest by entering setstage CWMission07 stage, where stage is the number of the stage you wish to complete. It is not possible to un-complete (i.e. go back) quest stages, but it is possible to clear all stages of the quest using resetquest CWMission07. This page was last modified on 1 September 2018, at 07:22.